Judge- Mr Stuart Whitfield, Batey Shield, Kellah, Haltwhistle, Northumberland. A small show of quality Galloways were on offer at the Society Show and Sale held at Harrison and Hetherington’s Carlisle sale centre, females were very much in demand with a 100% clearance with three new members purchasing. As with the other sales, bulls were sticky to sell with 7 bulls sold out of the 10 forward. At the pre sale show, the Judge Mr Stuart Whitfield, picked his champion bull Wallace of Fingland from W Wallace & Sons, Fingland, Dalry, Castle Douglas from the largest class of the day. 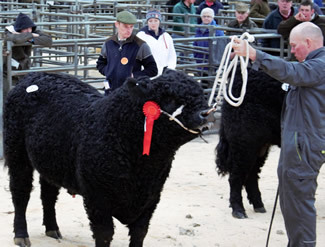 Wallace, is an X Factor of Fingland son and out of Joyce Knight of Todstone, a heifer which was purchased at the Todstone dispersal for 1250gns, Stuart then went on to back his decision by purchasing this May 2014 born bull for 1000gns. 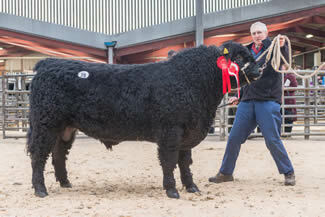 The reserve male Barlaes Notorious from Robert McTurk, Barlaes, Dalry also sold for 1000gns to G & A Todd, Blakehope Farm, Otterburn, Newcastle Upon Tyne. Notorious is by the 10500gns bull Barack Obama and out of Barlaes Grace 61st. This breeding also featured in the top price female and reserve female champion, again from Robert, Barlaes Grace 89th is an April 2015 born bulling heifer but this time out of Barlaes Grace 77th. This stylish reserve female is off home to Wales with D & A Weeks, Twynffilkins, Pontllanffraith for 1850gns. Next best price for the Barlaes team was 1450gns for Barlaes Grace 88th, this time a Barlaes JFK daughter she is off home with J & S Wareham, Little Tottingworth Farm, Heatherfield. for 1450gns . Two of the Barlaes heifers went over the Irish Sea with Mr B Douglas from Northern Ireland, both Brownies and sired by Barack Obama they made 1380gns and 1280gns respectively. Robert then spent some of his day’s takings and purchased a new junior stock sire Watchman of Kilnstown from the Waugh Family from Kilnstown Farms Ltd, Bewcastle. This 16 month old is the first bull to be sold off the new Kilnstown stock sire Buccleuch Adonis which was purchased privately from Langholm Farms Ltd which is owned by Society President The Duke of Buccleuch. 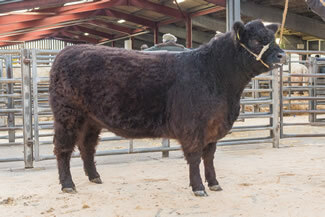 2800gns was top price of the day for West Acres Jack from Graham Noble, West Acres, Kirklinton, Carlisle, this May 2015 born bull is by the 1990 born AI Sire Grange Mozart and out of West Acres May, Graham’s only cow. Jack was exhibited at the local shows last year and this is where purchaser father and son team Keith and Max Welters, first saw him. He is off to Keith’s farm at Newcastleton for his 40 cow Heritage herd. Following their success in the Autumn, Drew and Betty Brown, Drumhumphry, Corsock, Castle Douglas once again received the female champion for Drumhumphry Xtreme, this October 2013 heifer is by Jake of Nether Rusko and out of Drumhumphry Lady Greta, she is off home with the Hoggs from Milnholm, Langholm for 1350gns. There were only three incalf heifers and they were from Walter J Henderson, Whitehills, Lockerbie, two Neilman of Whitehill daughters, Myrtle 598 and Lady Nancy 609 of Whitehill made 1400gns to new member RPW Evan, Dale Cottage Farm, Westington, Derby and Messrs Laurie, Snowden Close Gilsland, Brampton and the other heifer Brownie 596 of Whitehill which was also purchased by Mr Evan for 1100gns. Langholm based breeder S Busby & Co received 1400gns and 1100gns for two bulling heifers Annette 7th of Unthank and Tina 9th of Unthank, both by 3200gns Ben Lomond Silvester they sold to the Hoggs at Milnholm, Langholm and RN Waugh & Son, The Row, Roadhead, Carlisle. 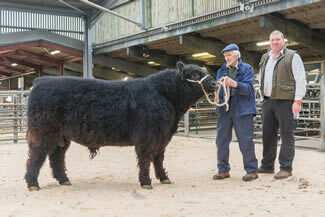 Kernal Rigg, Rowelton, Carlisle for 2800gns.